Clyde started his career with a large national department store and has just been promoted to being a buyer. He loves his work, and his company has been good to him and his young family. Clyde is now in charge of purchasing knives, forks, and spoons for the floundering flatware department, which has not even come close to meeting sales forecasts for the last three years. The expectations in the office are low, but he knows that if he can turn around the department’s performance, he will look like a hero and his future at the company will be bright. The previous flatware buyers had not stayed with the company for long. This weakened the company’s relationship with one of the major flatware suppliers. If the relationship did not improve quickly, Clyde feared he might lose the biggest flatware brand on his floor. As a result, he worked tirelessly to earn the confidence of the supplier by planning advertising and pricing promotions and communicating often. Five months into his new role, Clyde told several suppliers that he would be unavailable during the following week, due to the arrival of his first baby. Clyde received many congratulatory emails, but no gifts until now. Then his biggest flatware supplier sent a thoughtful card and a baby flatware set for his new child. The flatware set is small and inexpensive, worth about $25, and was sent directly to Clyde’s home, meaning that nobody at work will know about it. He feels honored by the supplier’s kindly gesture, especially considering their rocky history with Clyde’s company. He’s worried that he might offend them if he returns the gift, thereby erasing all of the work he has done to stabilize the relationship. The retailer’s no-gifts policy should make Clyde’s decision easy, but the situation is complicated by the knowledge that his boss had accepted a very similar gift from the same company just two weeks earlier. This creates an expectation—for suppliers and buyers—that it may actually be permissible to accept some gifts. If Clyde returns the gift, he risks making his own boss look dishonest for accepting the gift sent to him. Perhaps the supplier will question the integrity of the people who work at Clyde’s company, given the inconsistency around this policy. Clyde knows his wife will love the baby flatware set. No one needs to know if he decides to keep the gift, but many people will probably find out if he returns it. “It is just a kind gesture from a new friend,” he reasons with himself. “Sending it back will do more harm than good.” Clyde looks at the newly opened flatware set, wondering what to do next. In general, people put thought into their responses and took the hypothetical situation seriously. 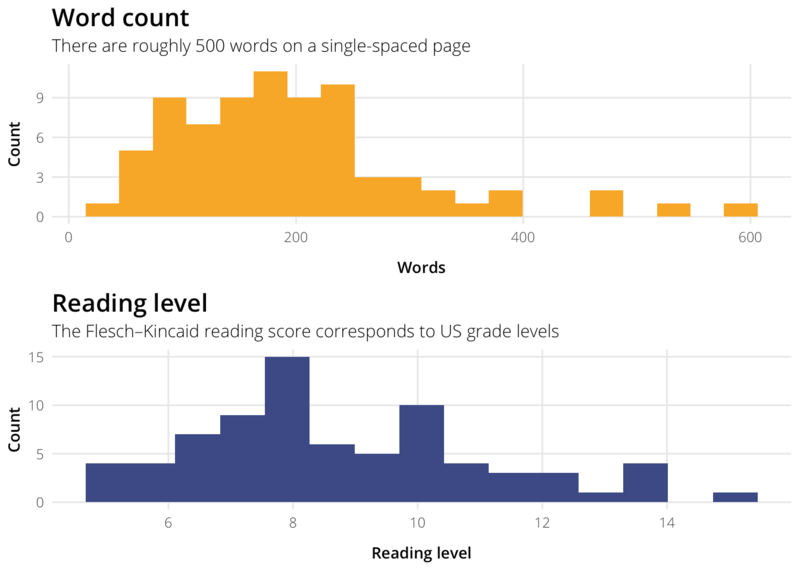 The average response was 200 words long and written at a 9th grade level. Give the gift to your boss and say it was from the supplier. If he insists on you keeping it than you have nothing to worry about. Otherwise he will take it and dispose of it for you. Congratulations on the birth of your baby and on your hard work. You’ve reached some important first milestones in your life and in your career. I would also advise you to consider the purpose of the company’s “no gifts” policy. It is likely that the company has created the policy to reduce the chances of favoritism or unhealthy ties to a particular supplier. Will your choice of keeping the gift pressure you to grant favors to the supplier in behalf of your company? Also, how serious is the no-gifts policy? Will you lose your job over it if someone finds out you kept the gift? It seems like your company has a policy of not accepting gifts, but a tradition of doing so. Is that widespread enough that is had become more the rule than the policy is? As your friend, I advise you to bring your situation to your company’s ethical group. Ask them to advise you on the policy according to your specific situation. If they agree that the gift is harmless, and simply a personal gift that won’t dramatically influece the way you do business on your company’s behalf, then you are fine accepting it. If they don’t give you a conclusive answer, I would suggest that you return the gift. I believe it is very important to follow rules, and preserve your honest. Though I also believe that sometimes human-made rules don’t account for situations that should be taken as exceptions. You can still further your company-supplier relationship by showing utmost integrity. You will win the respect of others and maintain a reputation as someone who won’t be pushed by tradition to break rules. If you take my advice, please write to the supplier, explaining your appreciation for the gift, and reminding them that your company has a no-gifts policy that they are trying to enforce. Though the rule isn’t accepted by all, many are being trained to undrestand its importance. Because you are new to the company, the rule is fresh in your mind and you desire to keep it. Let them know that the gift is lovely and you appreciate their kind gesture and their personal note. You could even purchase the set at your store so you can support both your organization and your supplier, and show how you advocate for your supplier’s products. I hope this advice helps you. I know that I can sleep well at night because I live without regrets. I hope you find the decision that will allow you to do so as well. 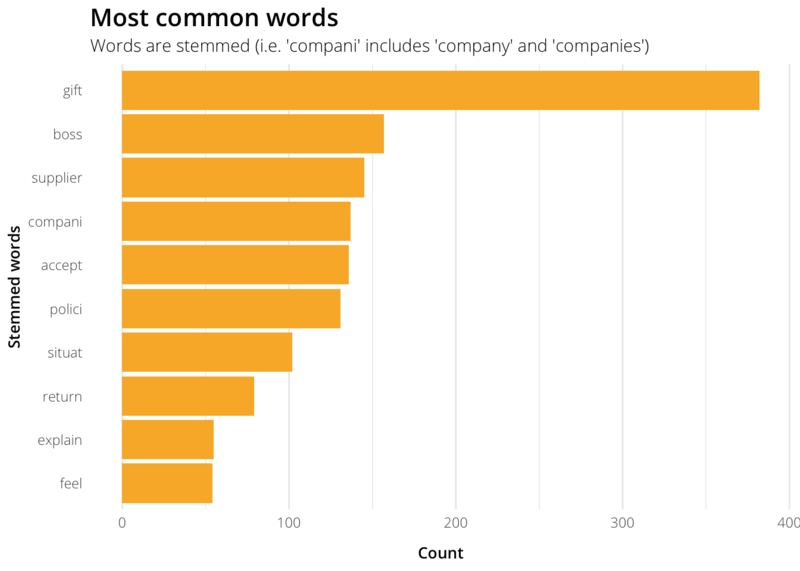 As expected, the most common words and phrases in responses reflect the situation, with people discussing the gift, boss, supplier, and company policies. 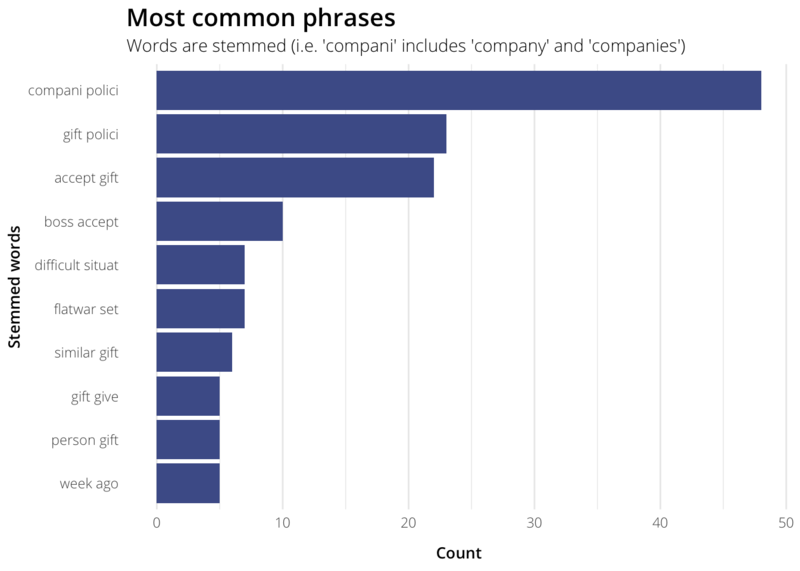 In their discussion of the ethical dilemma, nearly half of respondents used language that reflect’s the company’s value of integrity, including words and phrases like integrity, principled, honest, ethical, and right thing. 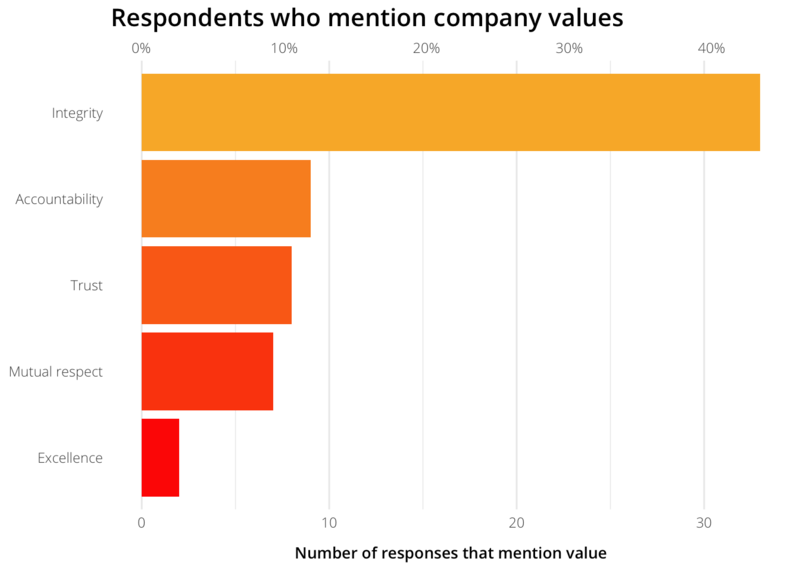 Respondents are less likely to mention other company values. 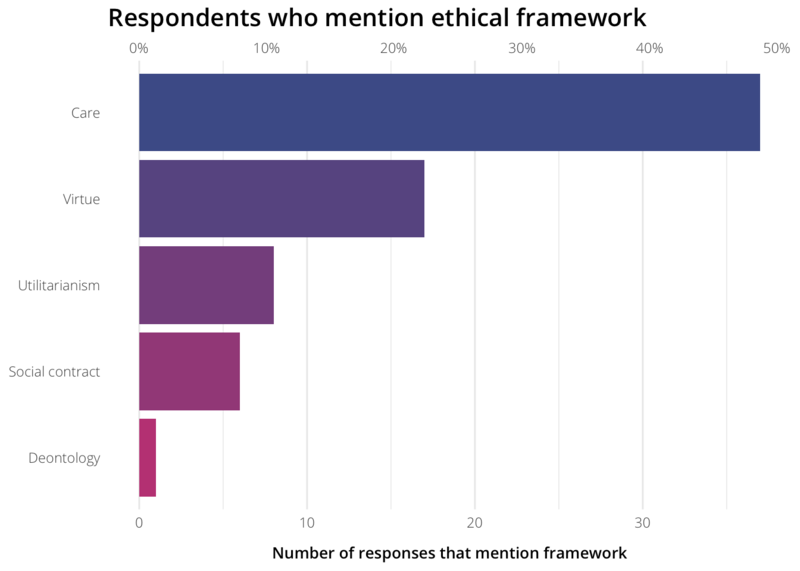 Responses also reflect the ethics training that people completed. Nearly half of respondents framed their answer in care-based language, mentioning phrases like relationships, vulnerable, family, and friends. A quarter discussed virtue ethics, while roughly 10% mentioned principles of utilitarianism or social contracts. 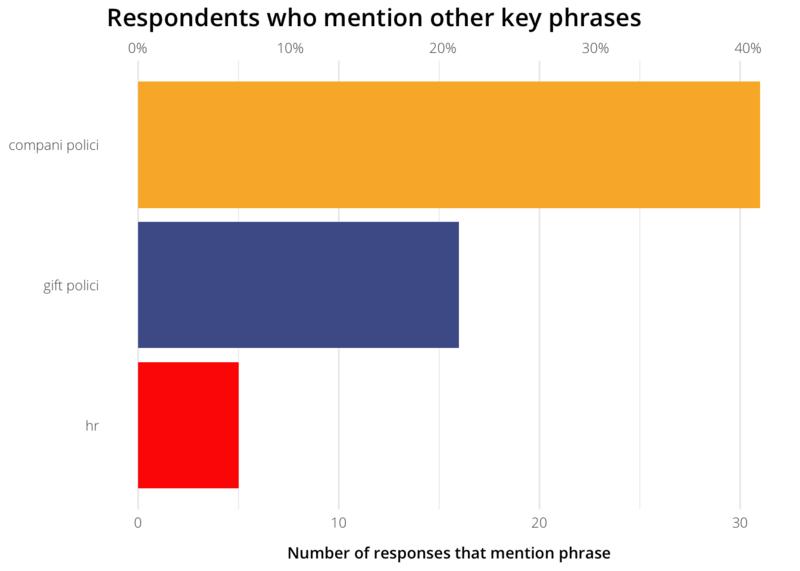 Respondents also mentioned other important phrases in their ansers. 40% discussed company policies, and nearly a quarter mentioned the company’s gift policy in particular. Only 5% talked about asking the HR department for advice. This is more useful when comparing multiple dilemmas. For instance, we can see how positive, negative, or uncertain respondents are when responding to the Clyde situation vs. other potential situations. Looking at the sentiment of just one dilemma isn’t entirely helpful. Later, once we have a large enough corpus of responses, we can hand code answers as “ethical” and “unethical” (or whatever categories we want), and then use machine learning to automatically classify new responses. For now, with only a couple dozen responses, this isn’t feasible yet. But this would be the gold standard—the algorithm would (in theory) be able to predict ethical vs. unethical responses on-the-fly.